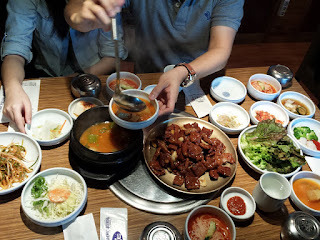 Even though I have been to Seoul many times, there are restaurants that I will go back to every time I visit. This is the recommended list from my personal perspective. I have included the Korean dish names so in the situation where no on can understand English, you can recognise the Korean characters. I really hope that one day, Rimini will have a branch here in Singapore because I have a constant craving for the 고르곤졸라 피자 (gorgonzola pizza with honey dip, 9,900 won). They serve good spaghetti as well. Almost all restaurants in Korea offers free flow of soft drinks and this restaurant is no exception. To ask for refill, just say "Re-pil jom hae juseyo" while pointing to your drink. 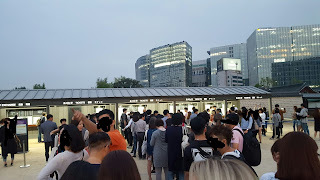 The most accessible branch should be the one near Ewha station (direction shown below) although I have never visited this branch before. Next all time favourtie is Wang Bi Jib. They offer cheap set menu between 1130am to 5pm. The recommended branch is in Myeong Dong. There are 3 branches there, hard to miss if you were to look up (at second floor). Assuming you are exiting from Myeong Dong subway (exit 6), turn right after you pass by Uniqlo and continue walking until you pass Nine Tree Hotel, look up and you should see their signboard which reads 王妃家. There is no problem with you speaking Chinese there. I have always order the two set menus below. 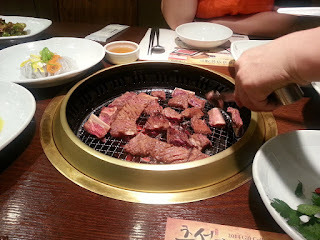 Do note that the meat are already bbq-ed when served. Pork set meal (portion for 4). 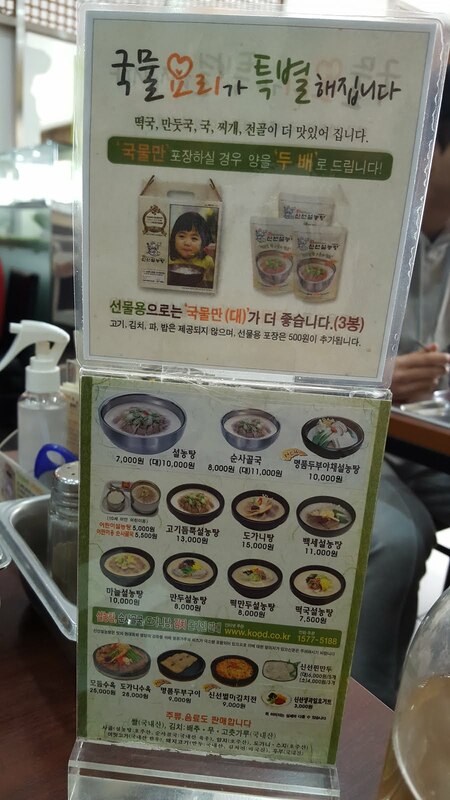 Comes with soy bean soup, cold noodle and lots of refill-able side dishes. Pork and beef set meal. This is where they film Shinning Inheritance (Ilsan branch). 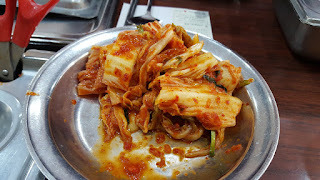 What I really love about this restaurant is their kimchi (they sell it in packs too)! They have two types of kimchi, one aged and one freshly made. I prefer the freshly made ones. 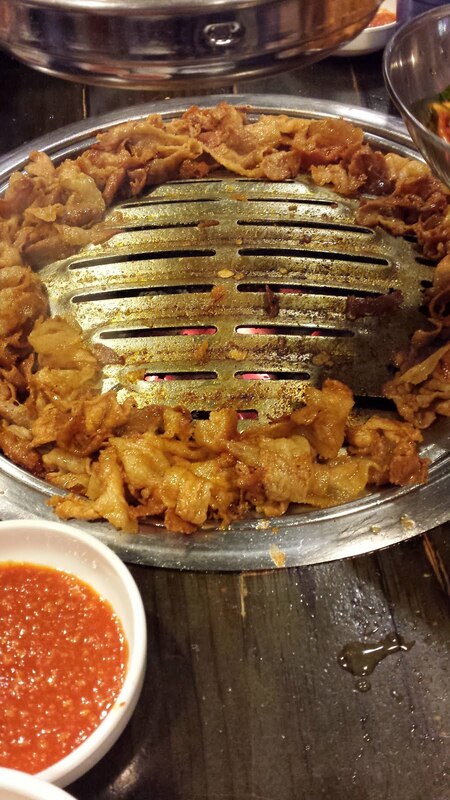 I think I consume more kimchi than the main dish. Again, you can get this at Myeong Dong (come out from exit 8, pass by nature republic and walk all the way down, can refer to KTO website). 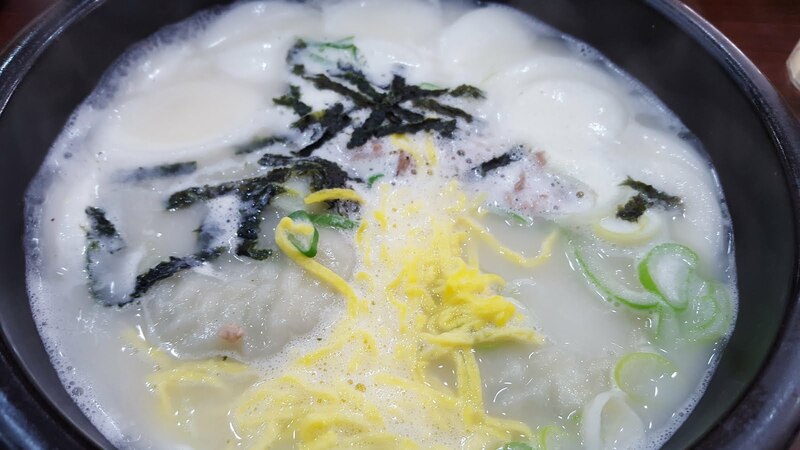 I love their rice cake dumpling soup. The dumpling is actually quite nice, not much meat in this though which is perfect for me. This is another of my favourite bbq pork restaurant. 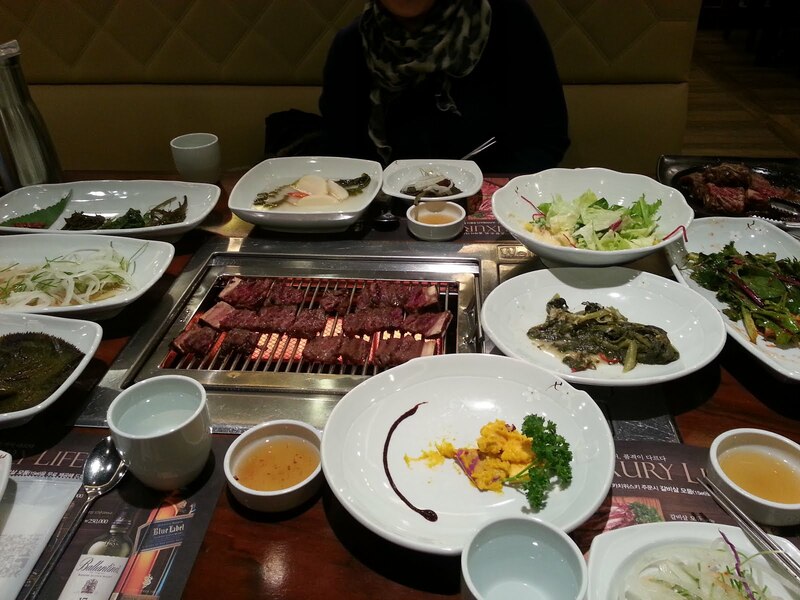 It is opened by 백정원 who is a celebrity chef in Korea. 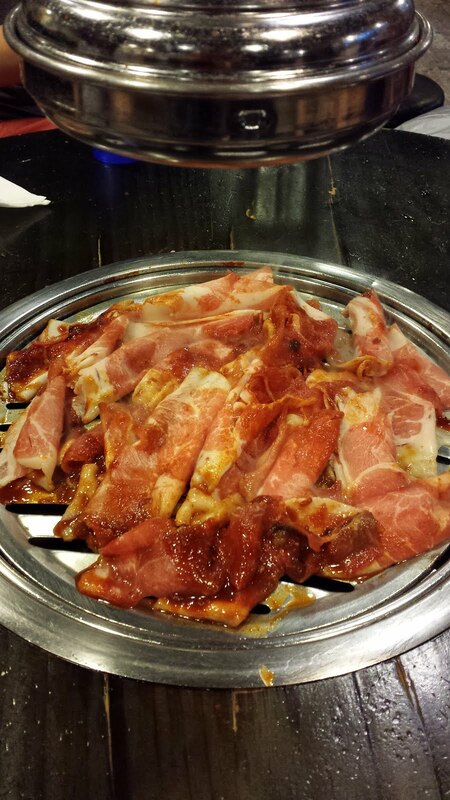 Order the 연탄불고기 (pronounced as yeon tan bulgogi which means charcoal bbq pork). 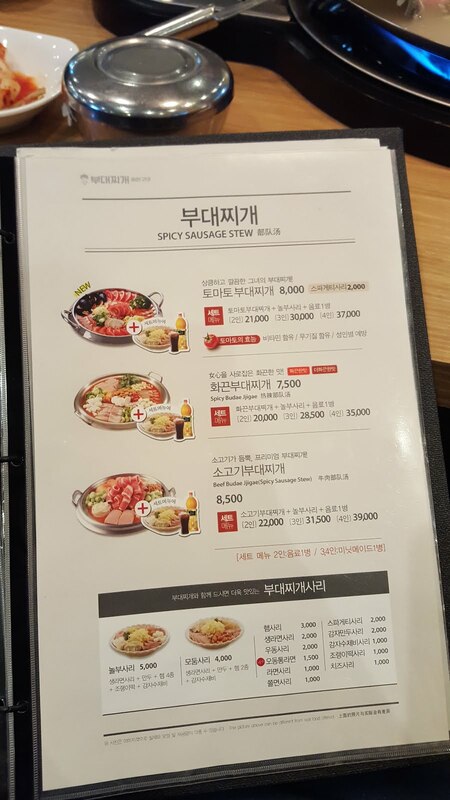 It costs 8,000 won for 1 pax. 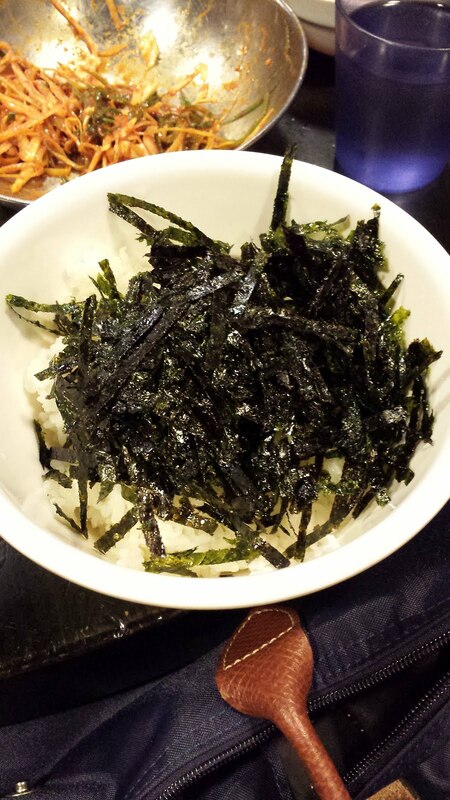 You will need to order rice (costs additional 1,000 won). The next "must order" from this restaurant is the 7분 돼지김치 (pronounced as chil bun dwae ji kimchi which meant 7 minute pork kimchi). 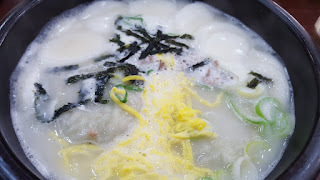 It is called 7 minute pork kimchi (by the way this is kimchi soup) because the chef believe that 7 minutes is the recommended cooking time. This dish costs 5,000 won and comes with rice. 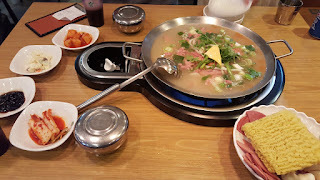 You can find this restaurant at either Hong Dae or Myeong Dong. Cleared the way in the middle so that we can heat up the kimchi soup (unfortunately I don't have a picture of the soup). 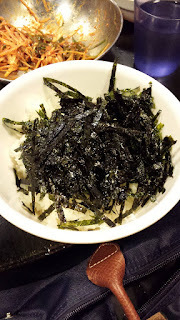 Seaweed is self service and free flow, make sure to cover your rice with heaps of seaweed. This is not really a restaurant but rather, an eatery which sells snack. 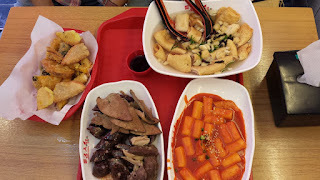 They sell spicy rice cake (매운떡볶이, 3,000 won per portion), tempura (수제튀김, 2,500 won for 5 selection), fish cake (부산 어묵, 700 won for 1 stick, 2,000 won for 3 sticks) and pig's intestine (찹쌀순대, 3,500 won). They have lots of pictures so don't worry about not being able to speak Korean. In any case, if you were to visit the Myeong Dong branch, you will find waitresses who are able to speak Chinese. Don't bother to fill up the order form as unfortunately, it is all in Korean. You can also go for their set menu. Usually we will order peach juice (쿨피스 which is pronounced as kul pis, 500 won). 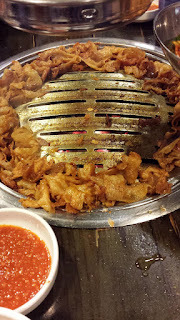 Update: Myeong Dong branch is closed. If you are a fan of beef, you definitely have to give this a try. You can either order the 송추갈비 (pronounced as song chu gal bi, 29,000 won per 250g portion, from USA) or 가마골갈비(pronounced as ga ma gol gal bi, 36,000 won per 360g portion, from NZ). The branch most accessible will be the one at B1 of IFC mall (Yeouido Station). This branch is newly opened. I am not sure if they have English menu. I am not a fan of fried chicken but the chicken at this chain restaurant is really well marinated. Even with the thick layer of sauce, it has the crunchy bite. 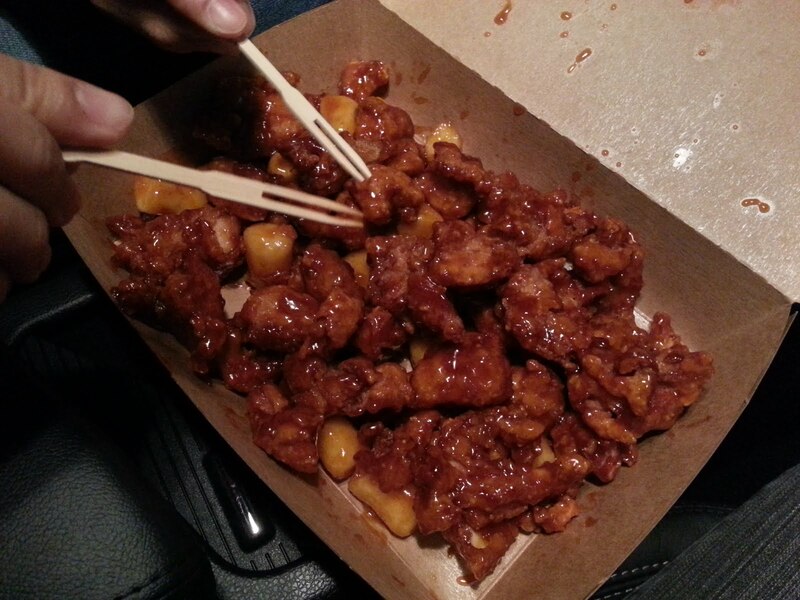 If you look clearer, you will find fried rice cakes packed together with the chicken. 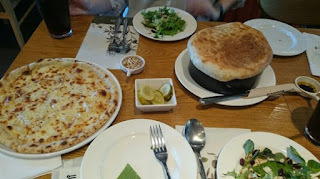 Having a bite of chicken and then rice cake provides a texture contrast. Although there are many branches around, they are not located in the tourist areas. If you happen to go to Yeongdeungpo for underground shopping, or visiting cafe MAMAS (refer to another post on this cafe), then you can drop by (refer to map below). This is a cafe that serves shaved ice (비수 pronounced as bing su). I really recommend the green tea shaved ice (녹차빙수 pronounced as nok cha bing su, 9,000 won). The shaved ice is very different from the ice kacang from home. The ice is finer and softer. If you are a fan of superman returns, you will note that triplets have been to this cafe before. 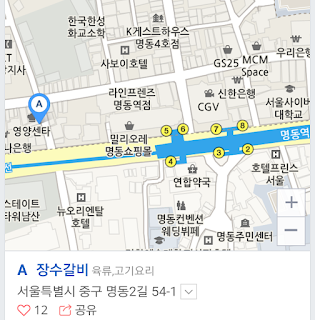 The most accessible branch will be in Hong Dae (see map below). Many might have come across this brand due to the celebrity endorsements (current one is Lee Min Ho). Their honey combo (교촌허니콤보 pronounced as kyo chon honi kombo) is something that I have constant craving for. 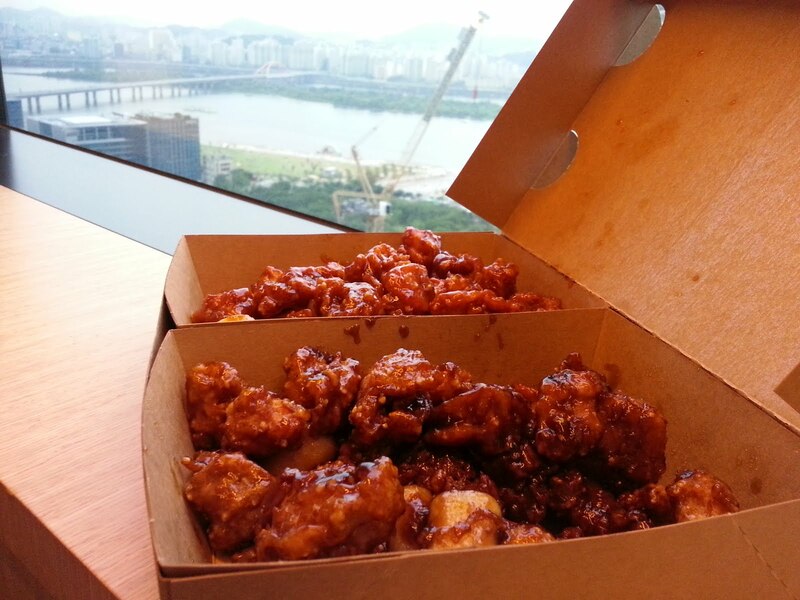 It consists of wings and drum and one box costs 18,000 won. It comes with pickled radish as well as small can of soft drink. They have lots of branches in Seoul. 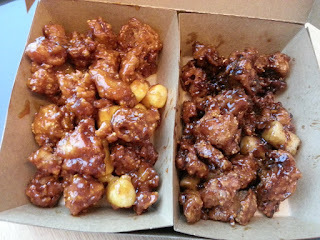 You can takeaway, dine in or order delivery (you need to know Korean). 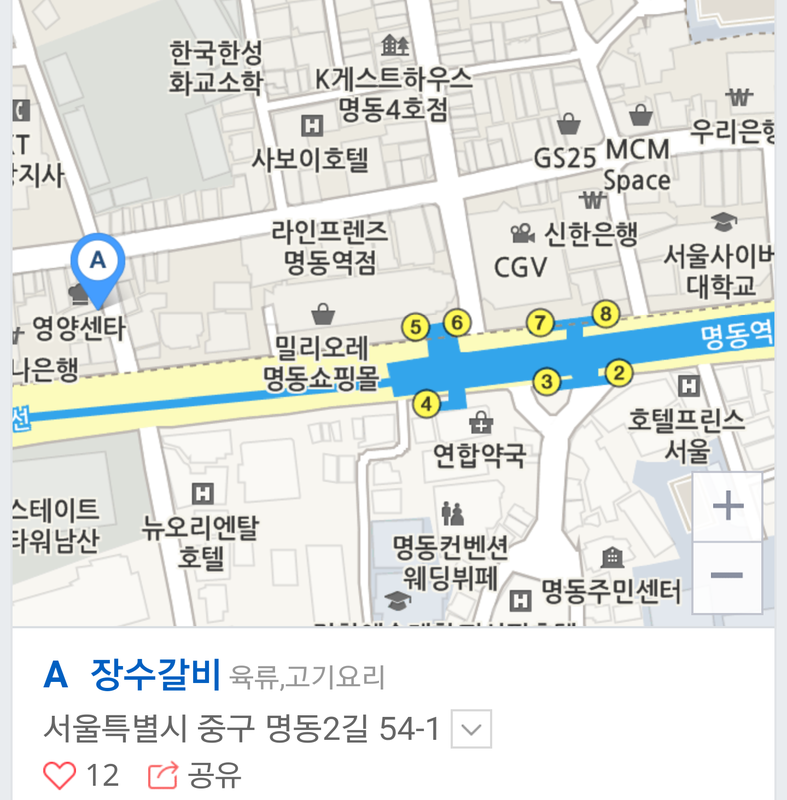 The most accessible branch will be the one near Dongdaemun station (refer to map below). It is located on the 2nd floor and opens 24 hours. This branch has both Chinese and English translation on the menu thus you need not worry. This is really crispy and delicious. 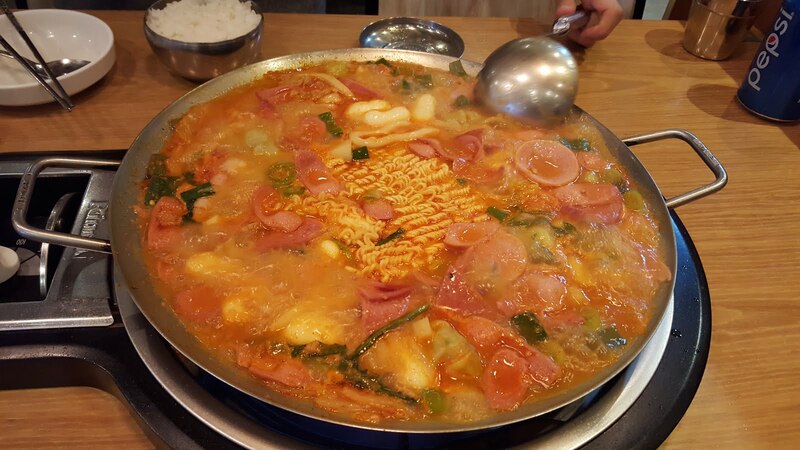 How can you give budaejjigae (known as army stew) a miss when you are in Korea. This dish has a story behind it. In the past, Korean soldiers used to eat leftovers (mainly sausage and ham) from US soldiers and they created this dish with a western korean fusion. You can find Nolbu almost everywhere, menu has English translation. We had ours at Yongsan Digital Mall (was looking for spigen S6 neo hybrid CC case but couldn't find it). 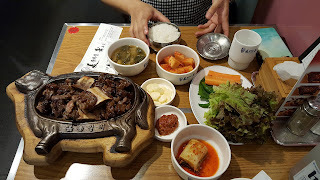 If you crave for decent galbi (beef ribs), do drop by Jang Su Galbi at Myeong Dong. 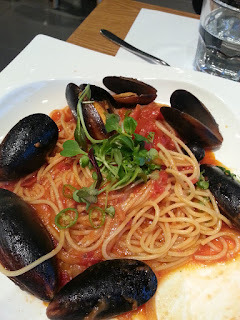 The above portion is good for 3 and it costs KRW12,000 for one portion. They have amazing churros and vanilla ice cream, the best that I have tried so far. 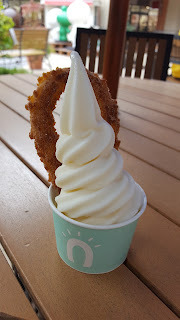 This is called 아츄 (Ah chu = ice cream + churros) and it costs KRW 3,000 a cup. This shop can be found in various location like Times Square (4F), Yong San IPark Mall (4F), Dong Dae Mun doota (6F), Paju outlet etc.